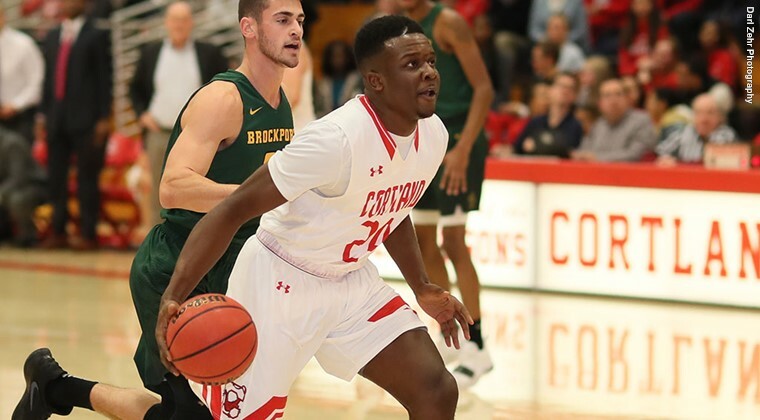 OSWEGO, N.Y. – Nicky Bonura (Mount Kisco/Fox Lane) scored 22 points and Kenny Charles (Huntington) and Justin Cooper (Pine Plains/Stissing Mountain) tallied 15 points apiece as Cortland defeated SUNYAC leader Oswego, 72-67, to hand the Lakers their first league loss of the season. Cortland improved to 15-5 overall and 9-4 in SUNYAC play with the victory. The Red Dragons are a game behind second-place Plattsburgh and a game ahead of fourth-place Brockport in the conference with five games remaining. Cortland is 10-1 in true road games this season, with the only loss coming at Division I Wagner in November. Oswego, the top team among the "others receiving votes" in the latest D3hoops.com national poll, had its eight-game winning streak snapped and is now 17-3 overall and 12-1 in the SUNYAC. Bonura hit 9-of-19 shots from the field and also added four rebounds. Charles made 5-of-6 field goal attempts and 4-of-6 free throws and Cooper was 5-of-10 from the floor and 5-for-5 from the line. Ryan Schmadel (Oriskany) added eight points and two steals and Brendan Fitzpatrick (Plainview/Plainview-Old Bethpage JFK) scored six points. Zach Lydon (Elizaville/Stissing Mountain) led Cortland with six rebounds and three assists. Tyler Pierre connected on 9-of-12 shots for Oswego and finished with 21 points, 15 rebounds and two blocks. He grabbed nine of the Lakers' 17 offensive rebounds that led to a 16-1 advantage for the hosts in second-chance points. Liam Sanborn ended with 14 points, eight rebounds and seven assists and Joe Sullivan chipped in with 11 points and six rebounds. Cortland shot 52 percent from the field and 80 percent (12-of-15) from the foul line. The Lakers shot 39 percent from the floor. Oswego led 35-33 at halftime and held a 49-44 edge on a Pierre layup with 12 minutes left. Cortland, however, went on a 23-5 run over the next eight minutes to take its largest lead at 67-54 with 4:01 remaining. Cooper scored nine points and Bonura had seven during that stretch. Fitzpatrick nailed a 3-pointer with 5:32 left and Bonura hit a trey at the 4:30 mark to push the lead to 11, and Ben Walters (Lockport/Starpoint) made a layup off a Fitzpatrick feed to close the run. Oswego fought back to within five twice in the final minute but got no closer. Cortland will travel to Plattsburgh next Friday and Potsdam Saturday.